A front door makes a statement about the appearance of your home. It indicates the presence of either a friendly or cold environment and is often the first thing guests see when visiting your home. A rich color or a wood stain both make for a nice palette. Change the entire look of your home by changing the color of your front door. If the door is wooden, refinishing it is a fairly simple process, and requires only basic tools and supplies. Take your front door from frumpy to fabulous by refinishing it yourself. Use a screwdriver to remove the door from its hinges and the hinges from the actual door. 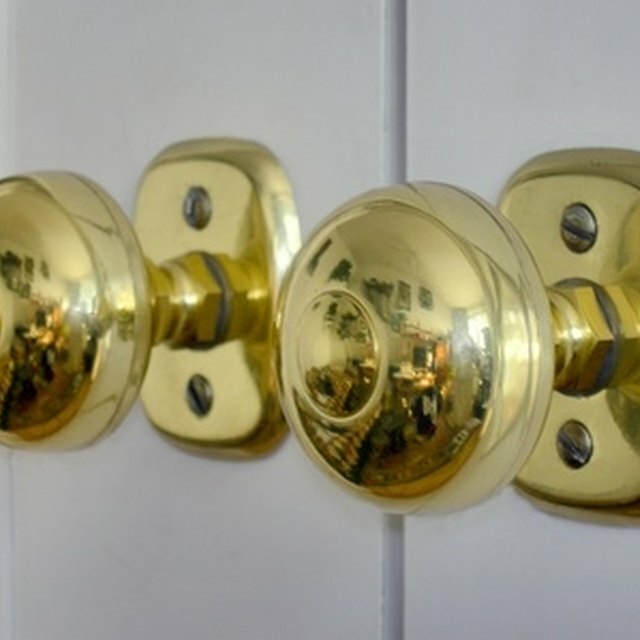 Remove the doorknob, lock mechanism and related hardware. Lay the wooden front door over two saw horses. Tape off any windows on the door using painters or masking tape. Use your electric sander with fine gauge sandpaper to sand the door. You may need to sand by hand with a piece of sandpaper near the windows, if they are framed. Brush off the excess dust from sanding using a clean paint brush or rag. Apply the first coat of stain using a brush. Wipe off the excess stain after a minute with a clean rag. Allow for an hour of drying time before flipping the door over to stain the alternate side. Repeat the process again. Wooden doors will require at least two coats of stain. You may apply more than two coats if the color is not the shade you expected. Allow the entire door to dry for 10 to 12 hours before proceeding. Apply a clear polyurethane finish coat using a clean paint brush. Allow the first side of the wooden front door to dry for four to six hours before turning the door over on the saw horses. Apply the finish coat to the alternate side again allowing for the same drying time. If you have a storm door, there won't be a need to apply a second coat of the clear polyurethane finish. If you don't have a storm door and your front door is constantly exposed to the elements, a second coat is a good idea. Remove the painters tape from the window or windows. Affix the doorknobs and locks to the front door, as well as the hinges. Attach the door to the hinges in the door frame.